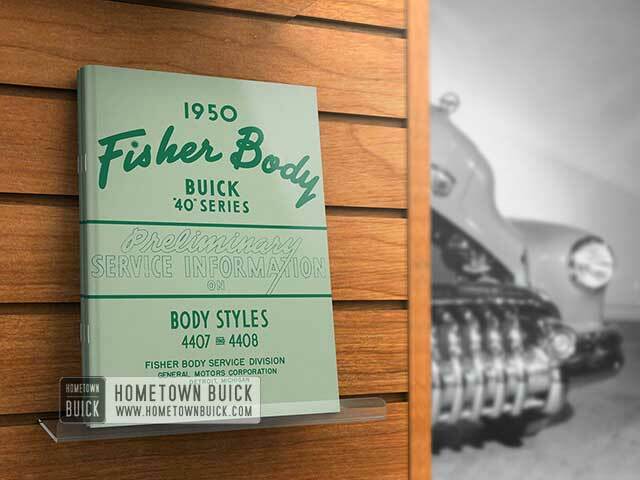 Preparatory to removing the 1950 Buick headlining, the following parts must first be removed: (a) garnish molding around windshield, rear quarter, and back windows; (b) sunshades and brackets; (c) dome lamp assembly; (d) rear seat cushion ;:v1d rear seat back; (e) rear seat back compartment top trim panel (imitation leather). The latter is cemented to the metal and may be removed by first loosening front flap from cement , unbending tabs under flap , and freeing remainder of panel from cement. Note: CLEAN HANDS ARE ESSENTIAL WHEN WORKING ON THE INTERIOR TRIM PARTS OF A BODY. Remove tacks or staples retaining headlining to upper windshield opening, rear quarter window, and back window openings, and from sides of seat back compartment shelf. Carefully release headlining from the headlining retainer tabs at the upper corner s of the windshield opening. Also release headlining from the retaining tabs at rear quarter section. See Figure No. 51. Starting at the front corners, disengage the head­ lining from its retainer s along both side roof rails. By loosening retain e r screws along both side roof rails progressively as headlining is loosened, it is easier to disengage the headlining from the retainer. On the right roof rail, remove screw and silencers holding ends of headlining support wires to side roof rail. 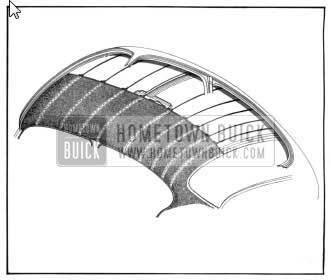 Note: Headlining support or listing wires are inserted through headlining listing pockets on the upper side of the headlining so as to form the head­ lining to the contour of the roof. The left end of each support wire is formed with an offset over which a rubber thimble is placed prior to inserting this end into a hole in the side roof rail. Starting at the front and proceeding towards the rear , disconnect headlining support wires from their attachment to the left side roof rail. At the roof bow, bend down the metal tabs and remove headlining from its attachment at bow. Proceed to rear and remove headlining. 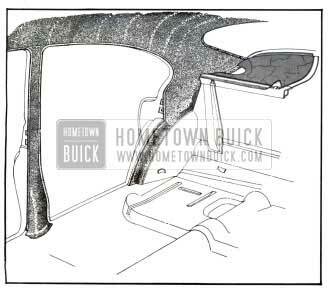 Install 1950 Buick headlining listing wire to its attachment on the single roof bow. Install the ends of the headlining support wires to their attachments on the side roof rail. Retack or restaple headlining around back window and at rear seat back compartment shelf. On the 4-door style, secure headlining material to retainer tabs at wheelhouse area. Stretch headlining to the front and tack or staple at windshield opening. All fullness must be removed from front to rear before installing the side section of the headlining. Engage headlining to metal tabs at front ends of headlining retainers at upper corners of windshield opening. Using a “Headlining Inserting Tool”, carefully tuck the edges of the headlining up under the toothed retainer along the side roof rails. Make sure retainers are tight before beginning installation. 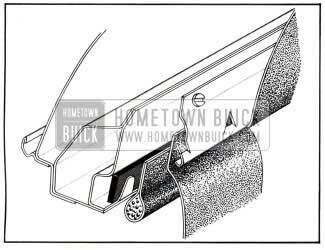 Retack or restaple headlining above rear quarter windows on the 2-door style. Install dome lamp; seat back compartment shelf trim panel; garnish moldings, sunshades; and rear seat cushion and back.